Experience a brand new production of the holiday classic with more magic and merriment than ever before! Follow Ebenezer Scrooge on a magical journey through Christmas past, present, and future and watch as our McCarter artists—joined by ensemble members from the greater Princeton community—bring this story to life all around you! We all know Tchaikovsky’s orchestration for the Nutcracker ballet, but listening to the complete score played in his own arrangement for piano solo, Stewart Goodyear (who you may remember from 2013 when he played all 32 Beethoven Piano Sonatas in a single day in the Berlind Theatre) will open you up to an entirely new perspective! Music Series subscribers may select this event to complete Series B. When subscribing online, please indicate you wish to attend this performance in the “Additional Requests” field. 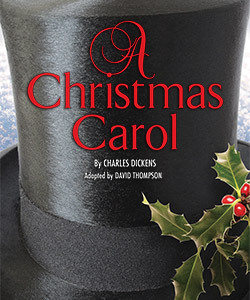 Click here for subscription pricing and additional information on Series B.
Handel’s masterpiece returns for the third year to join the American Repertory Ballet’s The Nutcrackerand McCarter’s new production of Dickens’ A Christmas Carol to constitute the unofficial “Holiday Season Triple Play” at McCarter. Note: this performance will take place at Richardson Auditorium and is a joint presentation of McCarter Theatre and the New Jersey Symphony. Partial view seats are available for this performance and can be purchased by calling the Ticket Office at 609.258.2787. Get ready for an evening of “hot” holiday songs when The Hot Sardinesreturn to the Berlind Theatre! All your favorites are here—Rudolph, Santa Claus Got Stuck in my Chimney, The White Cliffs of Dover, and more. The Sardines remain “red hot,” and everyone is hopping on their bandwagon to experience the “Sardine Sound”—a blustery brass lineup, layered over with a rhythm section lead by a stride piano, tied together with a one-of-the-boys frontwoman singer with a voice from another era. You won’t be able to resist the temptation to jump in and sing along! *Please note that zone restrictions or additional services charges apply when purchased with a Membership, Signature or Choice Pass subscription package. For more information, contact our Ticket Office at 609.258.2787.